The college admissions ordeal is more than a scandal – it’s much worse. We are learning more about how successful, powerful, influential, famous people allegedly have gone beyond bending the rules for their own advantage so that their kids can get admitted to certain universities and colleges. It is easy for us “normal” people to sit back and watch this story unfold with a scornful eye. But that should hardly be the focus. It is shameful that these parents knowingly and intentionally went to such great lengths to have their kids get admitted into schools. Lies, deception, bribery and outright fraud were all par for tIhe course. Some who may be sympathetic to the situation (Bueller? Bueller?) might argue that these parents were doing what so many other parents do: whatever it takes to help their child get into college. Just like so many normal parents who invest in their children’s future via a college education, this might include helping write an admissions essay, completing that unfinished homework assignment, or signing up for financial aid. There are many reasons why this story has created such an outrage. From my perspective, there is nothing more heinous than the fact that these parents have completely failed their children in teaching them values. Values that come to mind include faith, accountability, compassion, humility, loyalty and authenticity. There are also honesty, integrity, truthfulness and hard work. Instead, these parents have led by example in showing what greed, ego, fraud and envy are all about. That you can lie and cheat to reach a desired outcome. That hard work and merit has less value than dollar bills. That integrity is inferior to satisfaction. Instead of investing in the value of a college experience (certainly not an education), these parents should have been investing in teaching their children the values they will actually need to make it in the real world. This sort of values investing cannot be bought, but it does have a promising chance of outperformance. My wife and I are expecting the arrival of our first child in the next few weeks, and I am fully expecting to be thrown through the ringer in more ways than one. There are sure to be head-scratching moments, times of happiness and sadness, and many instances of not knowing the right answer. But what I do know is that we will always work to invest in the values that our son will have, no matter how hard that is. Note: this article was also featured on Mark Beal’s LinkedIn profile and can be viewed here. Winning the Lotto: Dream Come True? If a few million dollars - or more- fell into your lap tomorrow, what would you do? You may have heard of a big game happening in Atlanta on Sunday: Super Bowl LIII. (Do you remember what the Roman Numerals equate to?) The City has spent the past several weeks preparing for the estimated 150,000+ out-of-town guests to arrive, while over 1 million people are expected to attend the series of festivities leading up to the game. This year’s match-up pits the Patriots vs. the Rams – two very different organizations. The Patriots are led by 41 year-old quarterback Tom Brady and coach Bill Belichick, who need no introduction. This organization has been the gold standard of the NFL for the last two decades, having been to 9 Super Bowls and winning 5 of them (much to the dismay of Atlantans). On the opposite side of the field are the Los Angeles Rams, led by a 33 year-old energetic coach in Sean McVay and a 24 year-old quarterback, Jared Goff. The Rams are new to Los Angeles as of 2016, having spent the previous 20 years in St. Louis. By all accounts, a young organization in the NFL. That’s right, the Patriots’ quarterback playing the game is 8 years older than the Rams’ head coach, and he was basically graduating high school when the Rams’ starting quarterback was born! But here they both are, playing a final 60 minutes to lift the Lombardi trophy and be crowned the champions. If we look back at the performance of the NFL’s two leagues – the AFC and the NFC – over the last 10 years, is it any surprise that the Patriots and the Rams are playing in the Super Bowl? The following charts show the playoff seeding of the AFC and NFC over the last 10 years, from 2009-2018. Note that it does not show how those games actually played out (i.e. #6 Atlanta beat #3 Los Angeles in 2017) because there is no final seeding after the games are played – just that the winners advance. When looking at the NFC, what are your takeaways? Is it clear who was the best team over this decade? Atlanta has made the playoffs 5 times, but has nothing to show for it. New Orleans has 6 appearances and 1 Super Bowl victory. 40% of the time they didn’t even make the playoffs. Philadelphia has 5 appearances and 1 Super Bowl victory. 50% of the time they didn’t even make the playoffs. Green Bay has 7 appearances in the last 10 years but “only” 1 Super Bowl victory…should those odds be better? Meanwhile, the NY Giants have missed the cut on 80% of the last 10 playoffs, but they have the same number of Super Bowl victories as Seattle, New Orleans and Philadelphia. The truth of the matter is that in hindsight, we could say that the Green Bay Packers appear to have been the cream of the crop in the NFC for much of the last 10 years. I think that is a reasonable statement. But in any given year, there was no guarantee what would happen, and certainly no accurate forecasts at the beginning of the season. Now let’s look at the AFC. This one is a little different in that it is pretty easy to notice that the league was dominated by just a few teams. The aforementioned New England Patriots, the Denver Broncos and the Pittsburgh Steelers. In hindsight, we feel pretty good about saying, “Well, no wonder these teams were in the playoffs nearly every year and winning Super Bowls. Any fool could have predicted that.” Truth is, they might be right; but this has more to do with each of those teams having dominant, long-term quarterbacks that led their teams to victory. Tom Brady, Peyton Manning and Ben Roethlisberger are all future Hall of Famers. Picking one of these 3 teams, you like your chances of being right. However, Pittsburgh made the playoffs just 6 out of 10 years; Denver just 5 out of 10 years. They each have 1 Super Bowl victory over this time period. (Also note that Kansas City, Indianapolis, Cincinnati, and Baltimore all have 6 playoff appearances as well). Ah yes, the New England Patriots. 10-for-10 in playoff appearances. 5 Super Bowls played in, with 2 trophies hoisted (one will be determined on Sunday). Well, there is such a thing as periods of out-performance, and they have certainly enjoyed that over the last decade. But it is just as important to note that they had just 5 playoff appearances in their first 25 years in the league! The same holds true in investing. 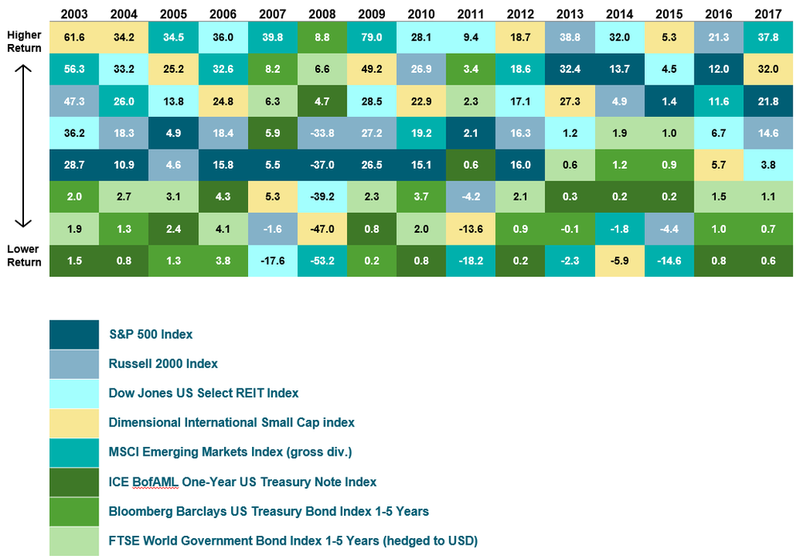 Each year, there are winners and there are losers among the different asset classes around the globe. Like the AFC and NFC playoff charts above, the below chart provides no decipherable information as to where the best place to invest your money is, or when. Anything can happen from one year to the next. If you don’t believe me, take a look at what Emerging Markets did in 2008 and 2009. First, that past performance does not guarantee future results. Second, that it is impossible to predict what will happen. We’re fooling ourselves into thinking we have some absolute knowledge that, in reality, is based on bias or emotion. Third, that there can be periods of out-performance (S&P 500 from 2010-present and the Patriots over the last 20 years) relative to peers as well as periods of under-performance (S&P 500 from 2000-2009 and the Patriots of the 1970s and 1980s). However, there is no data to suggest that it is likely to persist in the future. One thing we can all agree on: it is time for Tom Brady to retire. Did you do it? What is on the list? Surely, over the past few days, you’ve taken the time to jot down some new year’s resolutions for 2019. Exercise more. Eat better. Spend less time on the phone. Delete social media. Read more books. I’m guessing at least one of those made the cut. The start of the new year is where we make the time to reflect on the year gone by and set our focus for what we want in the year ahead. New Year, New You. Psychologically, that is such a euphoric feeling knowing that we all have this great opportunity ahead of us. We are choosing to set goals for things that push us to become better; things that are ultimately in your control. But there are things that you can choose and that you can control when it comes to investing. You can control your asset allocation and your risk. You can control how much you are saving and how much you are spending. You can control your expectations and your knowledge of investing and how markets work. Most importantly, you can control how you react to events that cause emotional turmoil. Hopefully you have a true financial plan in place and the recent market volatility has not duped you into making short-sighted or irrational decisions. If that’s the case, then New Year, Same You. Defined as the ratio between net profit and cost of investment of some resources. Return on investment, or ROI, is used to evaluate the efficiency of an investment and also to make a comparison of the efficiencies of different investments. The calculation is both straight-forward as well as versatile, and can be applied to many settings. Most often in the financial world, we might look at the ROI of our favorite stock holding (which is undoubtedly APPL or AMZN at the current time, right?). Say you bought AAPL at $100/share in July 2016 and about two years later it’s worth$222/share. ROI APPL = ($222 - $100) / $100 = 122% …Not bad! In the above example, the resource we invested was capital. However, one could argue that time is our most valuable resource. This morning I attended a great event hosted by Roswell NEXT, a local community organization which I am a part of. There, I had a conversation with someone about ROI. It seems natural that with our finite amount of time in each day, we look to join organizations, attend certain events, or talk to certain people based upon our perceived (or desired) ROI on that time spent. It makes good business sense, and hopefully you will be able to measure that by way of landing a new account or signing a new contract. But have you ever considered the importance of being involved with or doing something simply because of your interest in it? Volunteering with an non-profit you are passionate about; joining a local community organization; introducing yourself to the new neighbors who just moved in; or trying a new sport or activity. Time is our most valuable resource. Time spent on personal pursuits should be considered independently of professional networking and business development, but they should hold equal weight. There’s an ROI to those personal pursuits, though it may not be as efficiently measured. 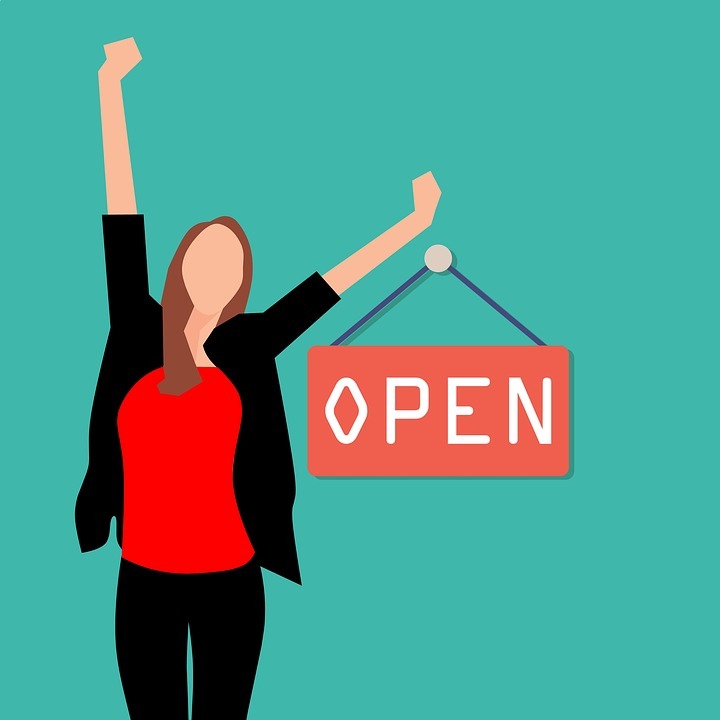 Should I start my dream business while the economy is good? I have enough money to get my business started, but I would be leaving a secure job. What advice can you give me based on what you have seen from your clients? If you are even considering being an entrepreneur, then chances are you already have the work ethic and drive to be successful. If you are thinking of becoming a business owner, then surely a strong and growing economy can only help your cause. In addition to having enough money to start the business itself, you need to have money saved to replace the paycheck you are giving up. What if you can’t afford to pay yourself for 6 or 12 months? 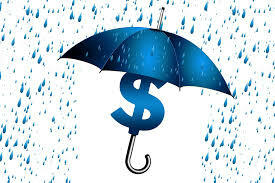 How will you pay your mortgage, car insurance, children’s daycare, or the multitude of other expenses that you have? Where will your health insurance come from? You also need to have a source of additional capital for your business. This may be additional savings you have, a loan from a family member, or a line of credit with a bank. One thing is almost certain, once you open the doors you will need more money at some point or another. Starting a business has infinite challenges and obstacles that must be overcome…there are entire books written on this very subject. The risks you take will hopefully lead to a great reward down the line. Make sure you are financially prepared before taking the plunge. Recently, we took a look at the S&P 500 which included a great visualization of the market cap of companies that make up the index. To many in the investment world, the stock market is still on its bull-market run (though there is some disagreement on the technical length of it). This means that companies which make up the index have grown in value as a whole. Individual companies have jockeyed for position with some being added to the list of largest 500 companies in the U.S. while others have fallen off. Josh Wolfe brings us another great visualization comparing the 10 largest companies in the S&P 500, from March 2009 to August 2018. Time surely flies, and there are so many historical lessons gleaned from market data. Arguably none more obvious than the rise of Amazon. But what about the tumultuous decade that Bank of America experienced? Or the fall of IBM, relatively speaking? Only three companies in the top 10 in March 2009 remained there in August 2018. Perhaps the most simple lesson learned from a chart like this is that we don't know what will happen in the future. What we believe to be the best companies at the current time may fall off in the not-too-distant future. Companies that we don't yet know anything about or are not evenly publicly traded may one day dominate the headlines and market share. Should I take advantage of a 0% interest credit card? What are good rules to follow regarding these offers? Full disclosure -- I have fallen for this before. When I was just out of college, I was making a big purchase and was offered to open a store credit card to give me 5% cash back and 0% interest for a period of time. I accepted, with the plan of immediately paying off the purchase with cash I had. In my mind, that was a free 5% discount. The unfortunate reality for most people is that store cards will end up costing them more in the long run. Even if they start with good intentions, many people do not fully pay the purchase off before the deadline. If you can’t pay it off quickly before the interest charges kick in, it will cost you more over time. 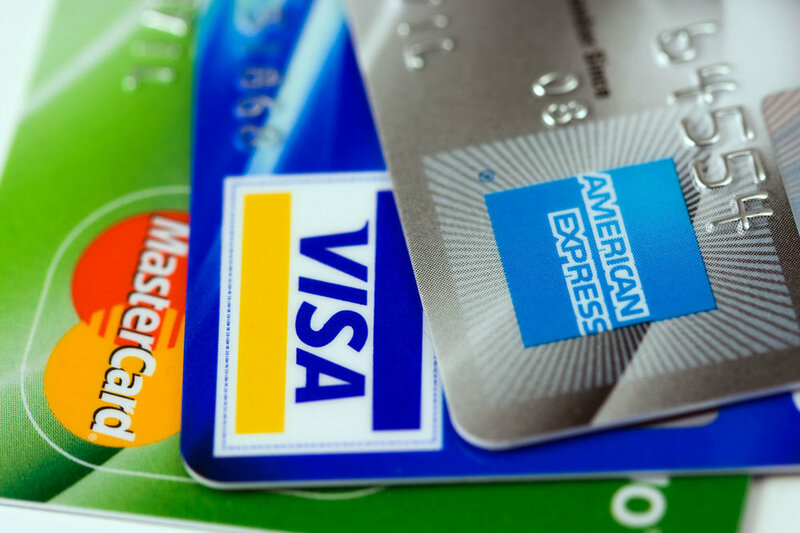 Many store credit cards carry interest rates of 20% or higher. A good question to ask is, would I be willing to pay 120% of the retail price for that item? Stick to cash or debit cards, or credit cards you already have if you are capable of paying them off each month. One last thing: never open a new credit card if you are in the process of getting approved for a loan, or think you may in the next 3-6 months. Should I buy a house now? I have a down payment saved up but I know home prices are high right now. Should I wait and hope they fall? You know what they say about trying to time the market, right? Well, the same can be true for real estate. As a buyer, you are obviously looking for the best house your money can buy you, and right now, houses are expensive. But don’t let that deter you from purchasing a home…if you are ready. Instead of focusing as much on the perceived “hotness” of the housing market right now and what you think it may or may not do in the future, turn your attention to the other factors that matter just as much. First, get pre-approved for a loan before you even start to look. Even better, after you’ve been pre-approved, look at your budget to determine what you can actually afford, not just what the bank will lend you. Where do you fall within the Housing Expense Ratio and Debt-to-Income Ratio? In addition to a down payment, will you need additional capital up front to update anything before you move in? There are ALWAYS unexpected expenses that come with owning a new home. Second, find a reputable realtor that will help you with your buying process. Most often, the seller pays real estate commissions for both sides of the transaction, so there is no cost to you in having a good realtor. It could, however, be costly if you don’t. Third, determine where you want to be. You may envision yourself in a specific neighborhood or part of town because it fits your life right now. But have you considered the schools in that area (even if you don’t have kids)? Have you checked out the property taxes there? How about traffic and your commute, growth of the city and surrounding areas, parks and community resources, or other variables? These may not necessarily matter to you now, but they may in the future and can also affect re-sale down the road. Buying a home should not be done solely based on the purchase price. It is one of the biggest purchases one will make in their lifetime. Be pro-active, and when the time is right for you, you will find a great place to call home. Should I sell my house now to take advantage of the equity while prices are still high? You can certainly cash in the equity you have to move into a house that is bigger, in a better neighborhood or school district, or just better meets your family’s needs. But keep in mind that chances are the new house you’re looking at has also increased in value and thus your equity may not get you as far as you think (or hoped) it would. Crunch the numbers to be sure you will be able to afford the new monthly expenses associated with a larger, more expensive house and that the equity you take out of your home will cover the down payment for a new one. And will you have to use any of that equity for moving expenses, new furnishings, or remodeling? Conversely, we get the question all the time of whether it makes sense to sell your current house to downsize to something smaller, and keep that equity. In all likelihood, downsizing to a smaller house in the same area may still require all of the equity you get out of your current house, after paying off any mortgage. Some people consider selling their home, investing the equity and renting until housing prices come back down. But can you truthfully say you know when that will be? Not to mention, you give up a fixed monthly mortgage payment for the risk of paying increasing rents which are beyond your control.